As a resident of east Tennessee, my wife and I really enjoy driving up and down the back roads between Chattanooga and Gatlinburg to eventually weave our way into the Great Smokey Mountains. During our nearly monthly drive, we love to look at the beautiful barns and silos across the rural landscape. While silos are beautiful structures protruding from the rolling hills and hollers of east Tennessee, silos within churches are nothing short of hideous. 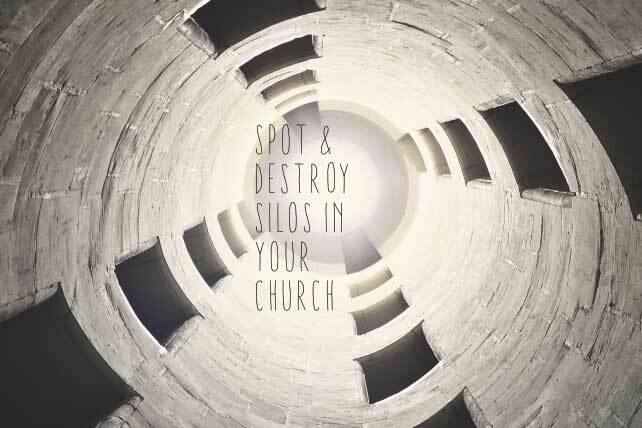 Silos within any organization are disunifying tools of Satan to cause division, animosity and strife. 1. “Us vs. Them” jargon is prescient. Instead of saying “we,” silo folks say “I.” This sort of jargon may not seem like a huge deal at first, but you better kill that before it becomes a major issue. The kids, student and adult ministries are all a part of one church. 2. Tons of stuff is labeled with various ministries’ names instead of them being available for the entire church. I have seen this plenty of times in my ministry, and it drives me bonkers. Quit allowing various ministries to say, “This ice chest is just for the _________ ministry.” Well, what if another ministry needs an ice chest? Should the church pay for another one? Of course not. This “my stuff” attitude is selfish, creates disunity and builds silos. 3. Staff members who develop silos often set up offices away from the rest of the staff. Want to intentionally build a silo? Isolate a person in a separate building, or far from everyone else, where others don’t see them around the office. This messed up office setup results in reducing camaraderie amongst others on the staff and results in a residue of resentment. Even if it costs a chunk of change, find a way to get your staff unified in their office setup. 4. Volunteers in a silo ministry will go to gatherings for that ministry, but not to the corporate worship service(s). They will go to your volunteer meetings. They’ll go to your events, even on Fridays or Saturdays when they could be doing something just for themselves. However, they put very little effort or concern into going to the most important time of all for the church…the corporate worship service(s) at your church. If they’re in the worship ministry and doing this, they’ll go to the music portion of the service, then leave, go to a green room or just check out somehow. A simple way to fix this is to make it where people who volunteer can’t serve unless they go to the church service. 5. Staff, volunteers and attendees in a silo ministry hold animosity for finances spent in other areas of the church. Sometimes, their frustrations are justified, and other times not. Either way, if they complain about it outside of time with their supervisor, it’s inappropriate. If they’re trying to build a silo, they’ll complain about the way the church’s funds are used to their volunteers and others in their ministry. I have a rule with my leadership: We can disagree all you want behind closed doors, but when we leave the office, we’re on the same page. I hope these tips will help your church become more unified. Have any additional thoughts on silos in ministry? Let me know in the comment section below.